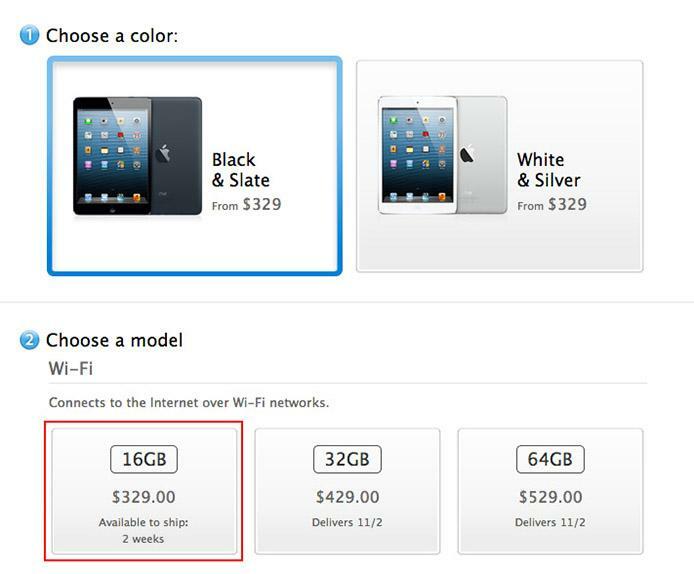 After just 35 hours of preorder availability, Apple's online store on Saturday showed stock outs of the 16GB Wi-Fi only black and slate iPad mini, with the entry-level tablet joining all white and silver models which quickly sold out on launch day. The Online Apple Store is now reflecting a two week delivery time for the smallest capacity black iPad mini, meaning the company has run through its initial supply as demand for the mid-size tablet continues. When the device was announced on Tuesday, some speculated that the mini's relatively high price tag would dissuade consumers from purchasing the premium tablet, especially given similarly sized products from competitors like Amazon and Google are priced far below Apple's $329 cost of entry. However, when iPad mini preorders went live on Friday at 12:01 a.m. Pacific, it took mere minutes for all capacities of the white Wi-Fi only model to sell out. It remains to be seen how the Wi-Fi + Cellular models have faired as those versions are set to ship in mid-November. According to Apple design chief Jony Ive, the iPad mini condenses the features of a full-size iPad into small form factor, featuring a 7.9-inch display and thin 7.2-millimeter chassis that weighs only 0.68 pounds.